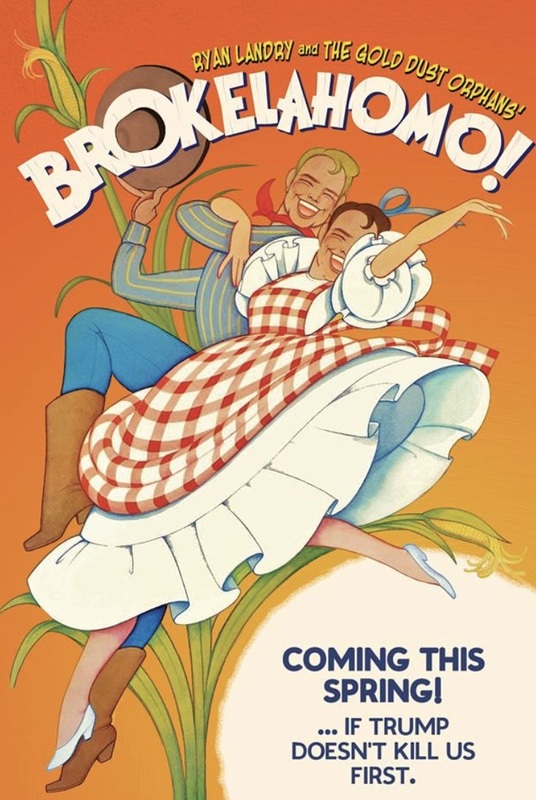 Ryan Landry and his Gold Dust Orphans newest musical, Brokelahomo, opens in less than two months on April 26th. Get your tickets before they sell out. Brokelahomo is a town in trouble. Overrun by dirty, outlaw gays, the few law abiding citizens left must spend their days dodging bullets, putting out church fires and fearing for their pets lives. That is until a heterosexual is sent for. Enter Dusty Rhodes, the unlikely hero of this far out fable set in the groovy 1880s! Will Dusty clean up the town? Or will the gay cattle rustlers and homo hoodlums head him off at the pass? Opening April 26th and running through May 27th, performances will run every Thursday, Friday and Saturday night at 8pm with matinees every Saturday and Sunday afternoon at 5pm. This entry was posted in Theater and tagged BosGuy, Boston Guy, Gold Dust Orphans, Theater. Bookmark the permalink. I’m excited to go – his shows are always a blast!